A country's income tax law regulates for citizens' personal income taxes to be based on their wage and income. Income taxation is calculated independently, and separately each payout instance. For each payout, if the amount does not exceed 4000 dollars, then 800 dollars of fees is taken away to get the base amount. If the amount exceeds 4000 dollars, then 20% of that is subtracted to yield the base amount. The base amount is then used to calculate the income tax rate. From the above, one should realize that both wage and income taxes are to be calculated in a compounded fashion. That is, one must start at the first income bracket and pay as much of that given range as possible according to the rate specified in the bracket. If there is money left over (their current amount exceeds the base amount range), then they move down to the next income bracket, where they apply as much of the excess amount as they can. This continues until they have exhausted all of the value. For example, an individual's wage for one month is 3800 dollars. After subtracting 800 dollars of fees, they apply the remaining 3000 dollars to each of the income brackets. Bracket 1 is completely filled with 500 dollars, bracket 2 is completely filled with 1500 dollars, and bracket 3 gets the remaining 1000 dollars. The rates applied to the brackets are respectively 5%, 10%, and 15%. Thus the total wage tax for that month is 500×5% + 1500×10% + 1000×15% = 325 (dollars). The calculating process is outlined in the figure given on the left. You must write a program to help a company keep track of the taxes they have to pay for one year, given the information of all of their payouts (the type of payout, time of payout, and the amount paid). Your program must find the sum of both the wage tax and income tax for all of their employees. Here, ID represents the ID of the employee being paid (an integer from 1 to M), Date is the date of the payout in the format MM/DD where MM is the month (1 ≤ MM ≤ 12), DD is the day (1 ≤ DD ≤ 31), and Amount is the amount paid in dollars (assume that each amount is a positive integer no larger than 1 million). A line with the character "#" denotes the end of input. Adjacent values in the input will be separated by one or more spaces. The output contains a positive number P, the total amount of tax (wage and income) that the company must pay on behalf of all of its employees for that year in dollars. This value must be rounded and displayed to 2 decimal places. xiaowuc1 on Jul 12, 2014 - 9:29:25 pm UTC Can the problem statement be validated? I've done the computations by hand and my output doesn't match the sample output given. Alex on Jul 12, 2014 - 11:37:40 pm UTC Re: Can the problem statement be validated? The samples are definitely correct. The description however can be quite confusing. You have to calculate the wage taxation separately for each month (in this case, the 8/14 and 8/10 ones have to be added). 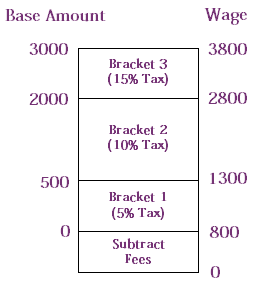 And for each calculation of the wage or income, you have to follow the bracketing system. xiaowuc1 on Jul 12, 2014 - 11:52:43 pm UTC Re: Can the problem statement be validated? ID 1 for month 2 needs to pay taxes on 3000. That's 500(0.05) + 1500(0.10) + 1000(0.15) = 325. ID 1 for month 8 needs to pay taxes on 7100. That's 500(0.05) + 1500(0.10) + 3000(0.15) + 2100(0.20) = 1045. ID 2 for month 12 needs to pay taxes on 19200. That's 500(0.05) + 1500(0.10) + 3000(0.15) + 14200(0.20) = 3465. The instance of 4010 is reduced down to 3208, and taxes on that are 3208(0.05) = 160.4. The instance of 800 is reduced to 0, so no taxes are incurred. Alex on Jul 13, 2014 - 12:32:01 am UTC Re: Can the problem statement be validated? Dangit! There actually was a mistake in the description - the income tax percentages were incorrectly transcribed. So sorry about that, it's fixed now. I'm trying to translate these NOI problems as fast as I can (there really is a lot and my goal right now is just to get them up), that's why there might be these sneaky little mistakes sometimes. I appreciate the efforts to point them out.